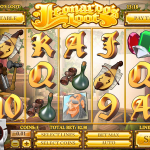 Leonardo’s Loot was released in 2014 by Rival. The game is set inside Leonardo Da Vinci’s workshop where you will be tasked to find some of the treasures he collected and created. The Wild symbol in this game is the Painting Palette symbol which substitute any symbol and double your prizes. It also expands on reels 1 and 2 to help you win combinations. There are also two scatters in this game. The first scatter are Leonardo’s Gears symbol. Landing 3, 4 or 5 will win you 10, 15 or 30 Free Spins respectively with a 3x multiplier. The other symbol is Leonardo himself. It is not a Bonus Round per-se but when he appears you will win a cash bonus based on your bet. 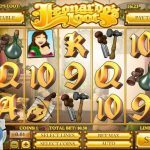 Leonardo’s Loot is quite a unique and enjoying slots game. You can see there was some serious thinking behind this game and it shows. The RTP are ok at 94% which makes it a game you should definitely try. Ever wondered what it’s like playing slots with a fine dining theme? 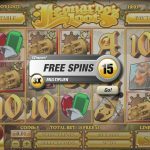 Try playing Jacques Pot a 5 reel slot by Rival.